Wintertime running is an evil necessity for anyone who doesn't want to lose their hard-earned progress from the warmer months. It also falls right around New Year's, when runners and non-runners alike are setting new fitness goals, many of which involve getting outside and moving. 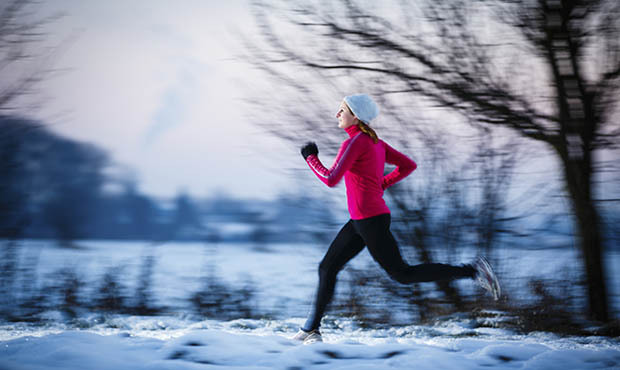 But as the temperatures plummet, the cold air can be unforgiving to a runner's body. Have you ever wondered why it hurts so much to breathe in cold air or why you lose feeling in your fingers—sometimes even with gloves on? We partnered with Eric Su, a fitness professional with RightFit Personal Training, to explain the science behind your winter running blues. Numb fingers and toes are one of the most common winter running sensations, and are caused by your blood vessels constricting in response to the cold air. This constriction, also known as vasoconstriction, reduces blood flow to your extremities, instead pushing that blood towards the center of your body and around your crucial organs, like your heart. This also accounts for why the most common areas of frostbite are your fingers, toes and ears. If you feel like you're sniffling your entire run, there's a reason for that, too. Cold air lacks almost any humidity or moisture and, as it makes its way through the body, dries out pretty much anything it touches. As you can imagine, your nasal passages take a big hit. The drip-drip of your nose comes from your body trying to relieve that dryness. Unfortunately, your body usually overcompensates, leading to that annoying, constant running. Have you ever felt that your runs during the winter are, well, harder? Even aside from the ice and snow or the extra layers, they just feel more difficult. There's an explanation for that, too. In freezing temperatures, your body has to work overtime just to keep your core temperature up. Even shivering—which is actually a series of involuntary muscle contractions meant to warm up the body—uses up precious stored energy, leaving less available for your run. In other words, the route you breeze through in the summer will feel a lot different in the winter. The silver lining? Colder temperatures increase your metabolic rate and calorie burning abilities—an added bonus for anyone trying to meet a weight loss goal. Ever feel like your lungs are burning as you take in big gulps of cold air? It's actually not your lungs. Your body is superbly equipped to warm up cold air as it travels through your body, and by the time it reaches your lungs, it already matches your internal temperature. The burning sensation you're feeling is actually tied to your trachea, which, much like your nasal passages, dries out considerably from the lack of humidity in the air. Muscles often feel tight in the winter no matter what you do. That's because they can't contract as efficiently in colder temperatures as they can in warmer ones. Cold temperatures means less oxygen is able to release from your body's hemoglobin, and therefore less oxygen is available for your muscles, which leaves them feeling stiff. Unfortunately, runners make this problem worse by doing their warm-up or stretching routines inside, not realizing that once they are in cold temperatures, their muscles tighten again. It then becomes that much harder to get yourself loose again, so it's important that warm-ups take place in the same cold temperatures as you're running in.